Data flows Diagram, Flow charts etc. Payroll System of Techpro Systems Inc. It is an user application with an user interface as front end to feed in and to retrieve the data. A database as back end to store the data. Problem analysis: In this the need of the client and users will be understood. It will be done by providing the questionnaire to the client to understand what exactly he want? How he want the new pay roll system to work. Whether he want any control over the system. If so what kind of control. Any constraint in the new system? How much investment the management is willing to invest in the new system? What or how much part of the system to be computerized? As it may involve in investing in new h/w systems like computers, scanners, web cams, printers etc. Discussions will also held with the users. Questionnaire will also be provided to them to know the present working of the system. What part of the system be computerized. The different reports they wanted. The input they provide to the present system and how the input is processed to get the correct output. What part of the manual system still they want to maintain. Even different methods like presentation, interaction, brain storming session will be conducted with the client and users to understand the present system and to provide them with specification document of the product. At the end of all these SRS of Payroll system will be generated. Pay slip for each employee will be generated and will be printed. Data flow diagram are used during the problem analysis. 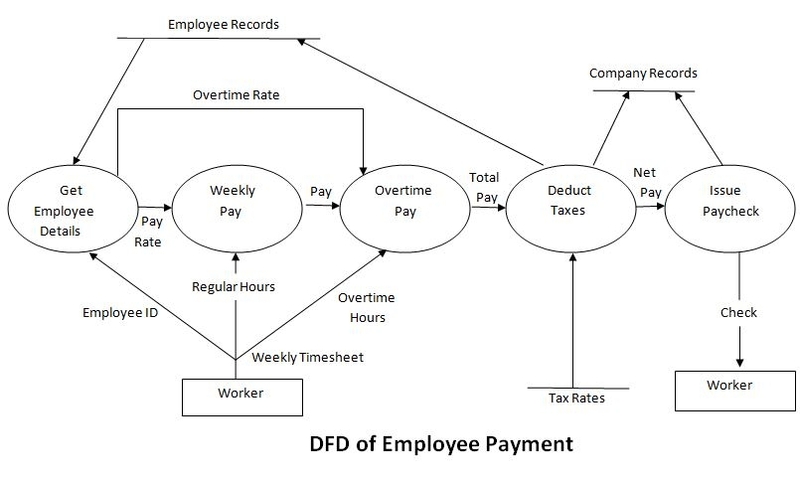 A DFD shows the flow of data through a system. Each of the individual modules like scanning module, Employee Details, Time sheet etc. are tested first to check whether they work according to the needs of requirement (functional testing) and these modules then linked and final testing is done with real time data. Each of these modules will undergo structural testing with different set of data.